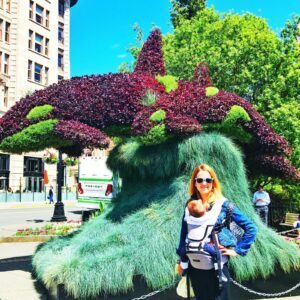 Are you thinking of a trip to Victoria with kids? Victoria is a beautiful city in British Columbia, Canada. 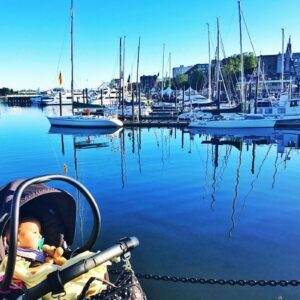 It is a ferry ride away from Vancouver, which is also an amazing family-friendly Canadian destination. There are so many great things to do in Victoria, with something for everyone. 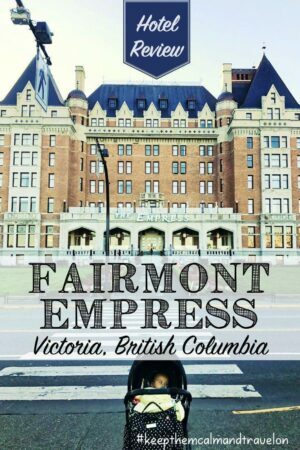 Here is my review of the Fairmont Empress Hotel which I found to be an awesome and child-friendly hotel right smack in the middle of the action. 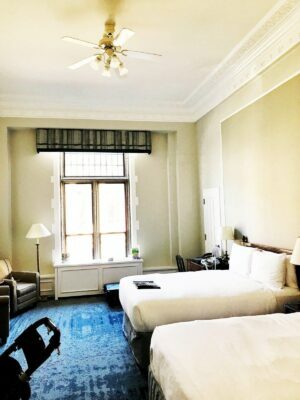 There is lots to love about this gorgeous hotel, including the beautiful empress hotel high tea and awesome harbor views. The rooms at the Empress were updated, large and comfortable. 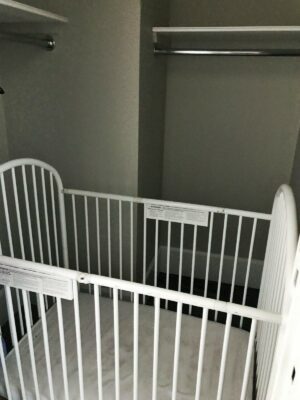 The BEST part of the room was that there was a LARGE walk-in closet that fit the baby crib inside of it. This was so huge! My youngest slept well and we didn’t have to sit in the dark when he was napping. I always love when a hotel has a closet or a bathroom big enough to fit the crib! There is a pool area including a very small “children’s pool” aka wading area. It is clean and beautiful and it wasn’t busy at all when I was there. I only traveled with my youngest son so I didn’t take him in the pool but I’m sure my eldest would have loved it. There are is also a sauna in the individual change rooms which was nice. Would be nice to have a steam room! The Fairmont Empress is famous for their afternoon tea and it did not disappoint. 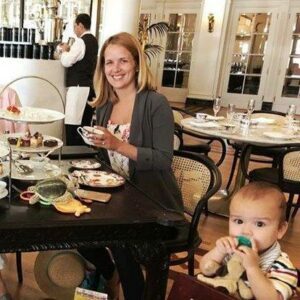 I have to give the hotel an A+ for having no issues with a baby who was basically throwing food the whole time at their fancy tea. The food was delicious and it was just loud enough that it was totally fine for kids without feeling stuffy. The staff and service for tea at the empress were excellent. You can’t beat the location of the Fairmont Empress. It is right in the harbor across from the ferry docks and is central to the shopping districts. We took a Hop-on Hop-off bus tour from right in front of the hotel that got us wherever we needed. As there was a time change, I was often up FAR TOO EARLY with the little one and we had some nice quiet walks along the harbor. Everyone at the hotel was very friendly and having a baby with us was essentially a breeze. Fairmont doesn’t have any baby specific amenities, however, other than a crib. I know that some other hotel brands will provide extra amenities like diaper genies, bottle warmers etc. so I can’t give the hotel an A+ in this regard. As always, make sure to check out TripAdvisor prior to booking your accommodation in any destination. You can book the hotel through Booking.com, which I like to use to compare rates at nearby hotels. Overall I really enjoyed my stay at this hotel and will definitely be rebooking if I return to Victoria in the future! The best type of vacation with young kids?